Blockchain foundational technology that underlies all the buzz around things like Bitcoin and Ethereum, is one of the biggest and most talked about supply chain trends we’ve seen in technology in some time. It’s also not very well understood, which means most of the conversations about it are happening in a very small circle—mostly by those in financial services. In reality, blockchain is a relatively simple system that has way more applications than just for banking. It deserves a place among emerging logistics trends as well. If you work in an industry that depends on a supply chain—and that includes essentially all retailers, food service businesses, ecommerce stores, and a multitude of other industries—you should understand what blockchain could mean for your business going forward. Essentially, blockchain is a public ledger system, where records of new transactions are linked together for the world to see. Unlike in traditional systems, there is no single record of the transactions. The ledger can’t be deleted or changed without everyone’s copy being altered, which means we all collectively keep an eye on the blockchain and keep it honest. If you work in an office setting, you probably use Google Docs or another kind of collaborative app. In the old days, maybe you used Microsoft Word: You’d write out a document, send it to a colleague, wait for them to make edits and send it back to you, and then you’d update your version. Now, with Google Docs, you can both edit the document simultaneously, and a record of what edits you made are kept in the cloud. Blockchain is like that—and there are public and private blockchains alike that can keep transparent records in the same way. Other metaphors for explaining blockchain—how it’s like a row of transparent safes, or DNA—can be found here. How Does This Help the Supply Chain? Supply chains were easy to trace when most commerce was local. Now that companies source their materials from all over the world, and ship to customers both around the country and internationally, it’s much harder to draw a reputable, secure line between every step of the process. As a result, many businesses are either the victims or perpetrators of supply chains that source materials from conflict areas, which is damaging to both the world we live in and the reputation of that business. Additionally, companies often lose valuable inventory when their shipments cross oceans or borders, with little recourse. In order to make sure everything is where it needs to be, companies spend vast sums of money on inefficient technologies, or waste valuable hours on paper and pencil checks and calculations. And customers are often left in the dark throughout the entire process of them ordering and receiving a product. They have no idea where their item comes from, how long it will take to get to them, or how much what they’re paying for is really worth. 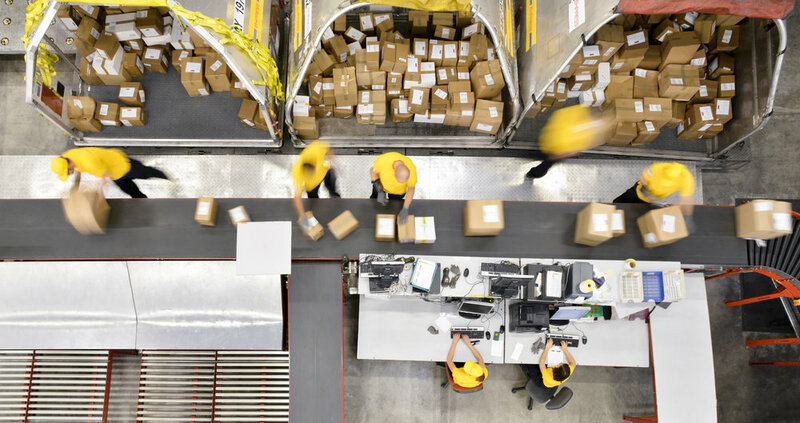 In many ways, current supply chains are broken, because they lack the ability to impart real-time, transparent information to all parties involved in the process. Increased transparency: Right now, transparency along the supply chain for most companies is somewhere near zero. Blockchain allows companies to document the journey for their inventory from its origin point, along its touchpoints, to its final destination—on a ledger that can be accessed anytime, anywhere. This reduces fraud, and reduces losses from counterfeits. Increased scalability: Need to add a new link to the chain and get new partners up to speed? You can allow virtually unlimited partners, along any touchpoint, to securely view your blockchain. Better real-time access: So much of supply chain information is passed among partners via outdated technology, from paper legal documents to electronic data interchange (EDI). But with blockchain, any changes to the information are immediately available to all parties. This is similar to how most inventory management systems are making the switch from manual processes to barcode technology that allows for instant updates with each scan. Lower costs per transaction: “Mirroring” is when documents about an account need to be duplicated before an account is settled, which is part of why the charges from any major logistics EDI gateway runs between $5-$7. But blockchain’s role as a master ledger where nothing needs to be duplicated means costs for transactions drops to near zero. Improved security: An incredible amount of time and money is spent on auditing records and ensuring no one has screwed with the numbers. A universal ledger with codified rules is more secure and less costly. More innovation: The decentralized architecture of blockchain means that businesses can work on new uses for the system anytime, and we should begin to see new and ever-improved functions going forward. What Is the First Step In Adopting This Technology? The Amazons and Wal-Marts and other tech giants of the world may find it easier to adopt elements of blockchain technology than SMBs. But that doesn’t mean, if you’re a small or medium-sized business owner, that you need to wait around for competitors before you start using blockchain. Most uses for small businesses and blockchain come from payment processing and contracts. Smart contracts are a great place for small businesses to start, since cash flow problems is one of the biggest and most common issues businesses face. If you’re hesitant about investing too much in a developing technology like blockchain in terms of moving all your operations over, consider the underlying tenets of blockchain: Digital, automated, real-time information. If your business is still using manual processes to track inventory across the supply chain, or relying on Excel spreadsheets and other tools that are often rife with human error, the first step is upgrading to automated management software, powered by barcode technology or RFID technology. That way, when the day comes to move everything to blockchain—and that day is coming for many businesses, perhaps within the next couple of years—the transition won’t be limited by the fact that you conduct so much of your business offline. Therefore, the first step in seeing benefits of blockchain is to, in effect, look to add those benefits to your own processes. Use cloud-based, scalable, automated technology, and you’ll find that the blockchain isn’t that great a leap after all.